Bear twins personalised birthday card or boy twin new baby card by Jenny Arnott Cards, perfect for newborn brothers or boys having their 1st birthday. 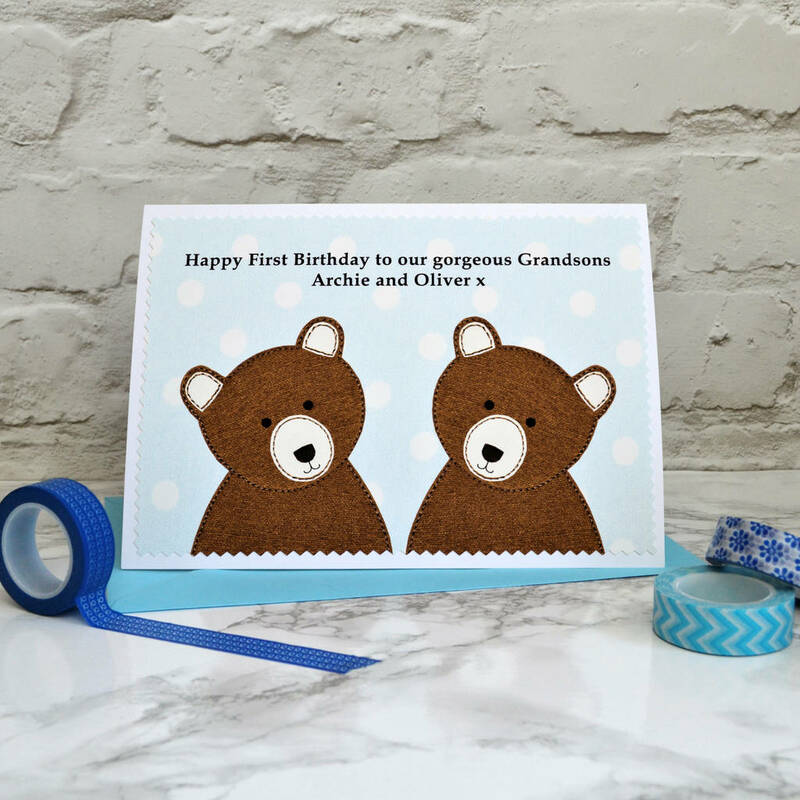 These large A5 sized twins cards have two cute brown baby bears on a pale aqua spotty background, and can be personalised with your own wording for newborn boys or for any birthday. 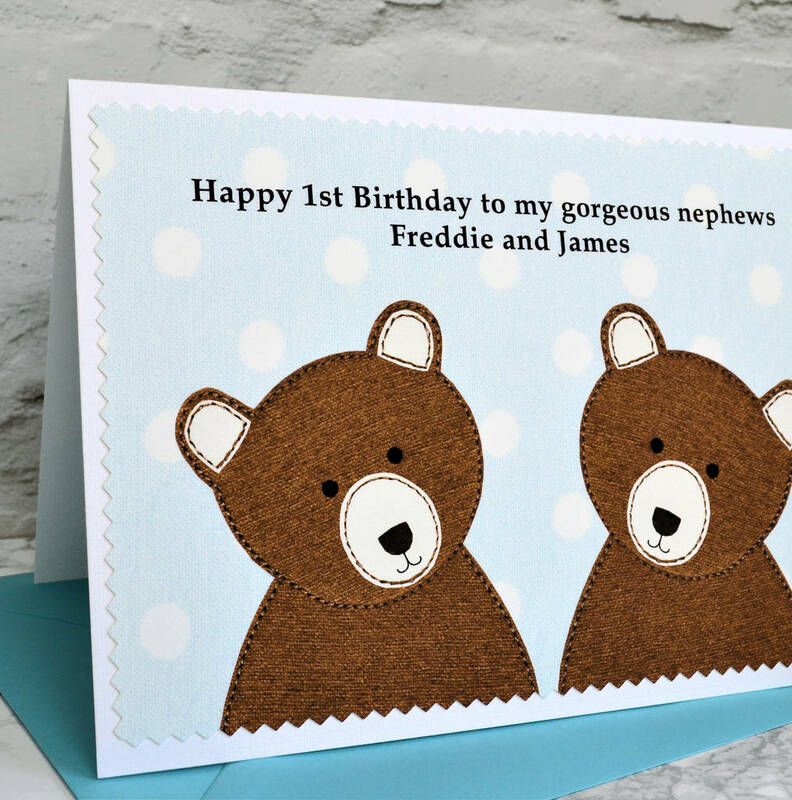 It would make a lovely first birthday card for twin baby boys who are turning one year old. The card can be personalised for any childrens birthday, including 1st, 2nd, 3rd, 4th, 5th, 6th, 7th, 8th, 9th or 10th. It would look great framed to display in the baby's nursery or playroom. 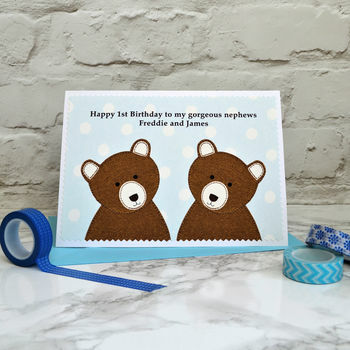 This lovely printed twin boy birthday card is by Jenny Arnott Cards & Gifts. The print does retain some fabric textures which were used in the design, however the card is not actually fabric but is printed onto beautiful artisan paper, trimmed with a zig zag edging and attached to a 350gsm textured white card blank. Each card comes with a turquoise blue envelope and is sent by first class post, protected in a clear cello wrapper and sturdy board backed envelope.